This Bitspower connector serves as a connector between a Wakü component with G1 / 4-inch female thread and a 10-mm inner diameter hose. The hexagonal connector is particularly protected against leaks thanks to a rubber seal on the G1 / 4-inch side and allows the use of optional hose clamps on the hose side. The carbon-black finish looks especially cool and will leave a lasting impression on every viewer. 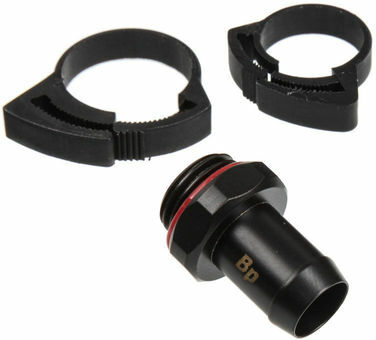 This is a black (carbon) G1 / 4 inch connector for 10mm inner diameter tubing. The hexagonal design makes it easy to connect water cooling components to a suitable hose. Thanks to a rubber seal, the G1 / 4 connection also has very high tightness. For safety's sake, the hose side should still be secured with one of the included hose clamps.